Cape Town - Wednesday's One-Day Cup semi-final in Centurion between the Titans and the Cape Cobras will not be remembered by many in the years to come. For the purist, though, this was as intriguing as it gets. Both sides went into the fixture stocked with Proteas, but on paper it was the Titans who looked the more powerful unit with Aiden Markram, Dean Elgar, Theunis de Bruin and Farhaan Behardien in their top six while Dale Steyn and Tabraiz Shamsi returned to bolster the bowling. Steyn (3/20) took two wickets with the first four balls of the match and his return was fantastic news for the Proteas, but it was Junior Dala (6/19) who steamrolled the Cobras' batting line-up. It was another superb effort from the 29-year-old, who is comfortably the leading wicket-taker in the competition this season with 26. To put that into perspective, Rory Kleinveldt is next best with just 15. Dala is a regular in South Africa's T20 set-up, but he has just two ODIs to his name. A ticket to the Cricket World Cup might seem out of reach, but given the fact that Proteas quicks Lungi Ngidi and Anrich Nortje are both struggling with injuries, Dala is not completely out of the picture yet. The other talking point of the first innings came in the form of 21-year-old wicketkeeper/batsman Kyle Verreynne. It's been some week for the youngster, who was placed firmly in the spotlight on Monday when his coach, Ashwell Prince, suggested that he should be going to the World Cup and a place be found for him in the Test side too. Those Prince comments, which raised eyebrows across the cricketing community, ensured that when Verreynne come to crease at 40/3 on Wednesday, he did so under a microscope. He may not have batted his side to victory, but Verreynne's patient knock of 65 (98) gave the Cobras a real chance. There were just five boundaries in his innings, and it was instead Verreynne's ability to work good balls for ones and twos that was impressive. Perhaps most significantly, he showed a maturity that few would expect from someone his age, and that is even more admirable given the attention he was given this week. He may not finish there, but Verreynne is currently the leading run scorer in the competition with 453 at an average 64.71. The real fun began in the second innings. Chasing just 188 runs for victory, the Titans were expected to cruise. A top-order wobble, though, saw the hosts fall to 53/4 and it was 'game on'. That was when Behardien came to the wicket, and when Markram fell soon afterwards, the Titans were on the ropes at 65/5. At 35, Behardien will almost certainly not play for the Proteas again. He will end with 59 ODIs and 38 T20Is to his name, averaging over 30 in both formats at healthy strike rates of 97.90 and 128.21, respectively. 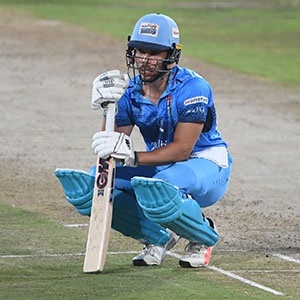 Behardien is considered one of the best finishers in South African domestic cricket's recent years, but on Wednesday he showed that there is so much more to him than simply clearing the ropes at the back-end. Like Verreynne, Behardien was a picture of composure throughout his match-winning 75* (92) in what was a high-pressure situation. He was unflappable, and he proved for the umpteenth time in his career that he is made of the classiest stuff. For one or many unknown reasons, 'Fudgie' has always struggled to win over a sometimes difficult-to-understand South African cricket audience. If you speak to anyone who has ever played with Behardien, though, they will tell you just how dangerous a player he is. He has the respect of his peers, of that there is no doubt. Over the years, Behardien has delivered time and time again on the domestic stage and while it may not have clicked for him the way it should have at international level, that should not detract his overwhelming contribution to South African cricket. He is a domestic stalwart in the mould of Dale Benkenstein, Adam Bacher, Andrew Puttick, Stephen Cook, Neil McKenzie ... the list could go on. The point is that he has earned his stripes through years of consistency. His numbers back that up. Verreynne and Behardien almost single-handedly carried their sides on Thursday. It was a beautiful thing to watch, given that they are at completely opposite ends of their careers. On one hand, you have a player with 15 years of first-class cricket behind him; a player who has done just about all there is to do in white ball cricket but who, despite still being at the top of his game, has failed to earn the respect of large parts of the cricketing community. On the other, you have a young man with limitless possibilities lying ahead. Behardien doesn't have to be in your World Cup squad and he doesn't have to make your all-time Proteas XI, but it is so tough to fathom how anyone who looks back at what he has done for South African cricket over the years could still question the class of the man. Give him that respect, at least. With an international debut surely not that far away, Verreynne is about to embark on his own journey. We can only hope that as he is given the backing of the South African cricketing community that Behardien never quite had.